When you stay with us you can expect friendly greetings with affordable, clean and comfortable accommodations. The Talkeetna Northern Guest House offers lodging on a quiet street, 2 blocks from downtown Talkeetna. All of our guests are eligible for discounts on flight seeing tours and some other activities. Be sure to take in the majestic views of Denali and the Alaska Range from the banks of the Talkeetna River during your visit. We have bicycles for our guests to use, free of charge. We also have ping-pong, badminton, indoor and outdoor fire-pits, games, puzzles, books and movies. Private rooms are available for rent in the main guest house. Guests enjoy B&B style accommodations with each room having a private bathroom with shower, alarm clocks, heaters, extra blankets, towels and pillows. Each room has at least two beds, some with three beds. The TNGH is pet friendly, so your pet is welcome in your room (on pre-approval). All guest have use of the common areas, which include use of a full kitchen, dining room, comfortable seating in the living room, upstairs reading room, outdoor fire pits, DVDs and VHS viewing, ping-pong, and a piano! Our rate for rooms is $60/nightly for one person, and $20/nightly for each additional person, per room. Price does not include 8% tax. 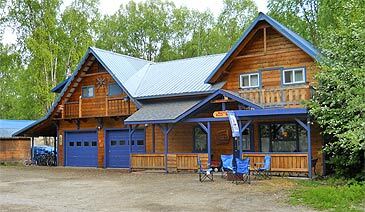 For travelers interested in lodging for a large family or group, the Talkeetna cabin rental provides accommodations for 10 or more people; making it ideal for special events, weddings and gatherings. As most wintertime travelers in Alaska know, many of the lodges and Bed and Breakfasts in Talkeetna are only open during the summer months. TNGH offers winter lodging for travelers who come to experience the many activities and events Talkeetna has to offer during this time. Winter activities include dog mushing, skiing, snow machining, snow shoeing and ice-fishing. Local wintertime events that draw crowds include the Wilderness Women Competition, the Talkeetna Bachelors Auction, the Oosik Classic Ski Race and live music concerts. We do offer pet friendly lodging for guests traveling with pets. Pre-approval is required as well as a $25.00 pet deposit. Your host, Paula, has lived in Alaska since 1980. She started out living in the remote areas of Alaska without running water or electricity for 15 years. She has commercial fished, ran dog teams and built cabins, both log and frame. In 1994 Paula moved from the remote cabin north of Talkeetna to the town of Talkeetna, opening up a retail and repair business at the current Guest House location. That business moved, allowing her to renovate the building into the current Talkeetna Northern Guest House rental business. She has volunteered at the elementary school, worked with the seniors and VFW, is currently with the local ambulance team, and always still building. She built Talkeetna Northern Guest House from the ground up and takes pride in providing quality lodging for her guests.